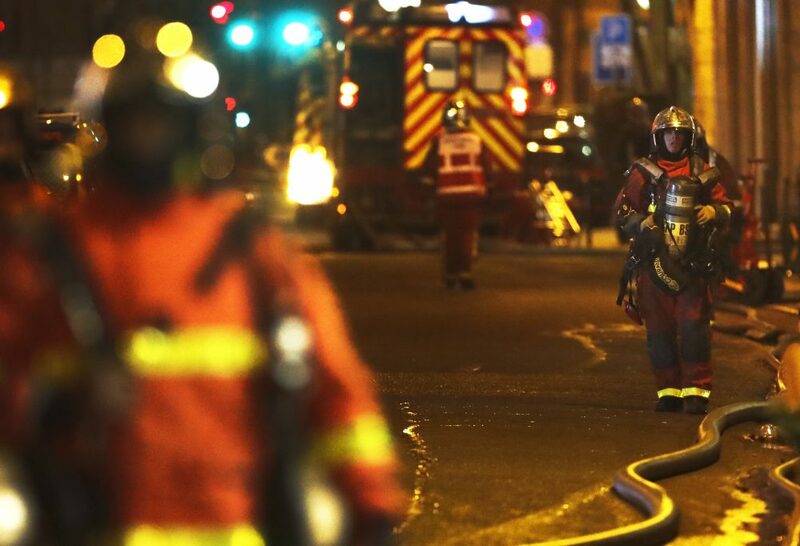 A resident of a Paris apartment building where a fire killed at least 10 people is under investigation for arson. PARIS — Paris’ deadliest fire in over a decade killed at least 10 people Tuesday as flames engulfed a nine-story apartment building, sending residents to the roof and clambering across balconies to escape. Police responding to the dispute stopped by the woman’s apartment earlier in the night. The firefighter and his girlfriend told officers they were leaving to go sleep elsewhere in peace and warned them the neighbor had lost her mind and one day there would be an accident because of her, according to a police report seen by The Associated Press. The fire started sometime after midnight and originated on the same floor the suspect and firefighter occupied. Survivors described a chaos of smoke and flames. One neighbor recalled clambering out of her eighth-floor apartment and over balconies to reach safety. “I climbed across several balconies, with nothing beneath, and then was backed into a corner. There were people climbing hand-over-hand to get to where I was and escape the flames,” said a resident identified only as Claire, her eyes wide with shock soon after her rescue. “I couldn’t save everyone. I can’t forgive myself,” the man identified as Fabrice told France Info radio, adding that smoke and flames prevented him from climbing higher than the fourth floor. It was the deadliest fire in Paris since the April 2005 hotel fire near the capital’s famed Opera that killed 24 people. Over 30 people were being treated for “relatively” light injuries, Castaner said. Among the injured were at least eight firefighters. A police patrol responding to a trash can fire around the same time spotted the woman with her hand in another trash can, according to a second police report obtained by The Associated Press. She was staring at the firetrucks streaming toward the building, the document states. The document says the officers put the woman under brief surveillance and detained her at 12:45 a.m. after she allegedly tied a scarf around a car’s rear-view mirror and raised a cigarette lighter to it. Firefighters plucked some people from the roof and balconies, at one point pleading with ae man to stay where he was. The fire was extinguished by midmorning. Samuel Petrequin, Nicolas Garriga and Angela Charlton in Paris contributed.